The following concerts in Tofino are happening in the month of July 2007. Tickets are available at Tofitian, Long Beach Market (Esso) and at the Common Loaf. Western instruments and concepts of improvisation are explored and layered over what used to be called afrobeat; but the term strains to contain the innovations happening in the rhythm section at every show. It also fails to express in fiery-enough terms the contributions of notable and electrifying vocalist/performance artist Johan Hultqvist. Breaks and basslines are designed to induce and sustain a state of ecstatic dancing. The horn section strikes with power and uplifts with melody. Above all, acting as a lighting rod for the combined energies of a Mr Something Something event, is the lyrical statement of the case for change and consciousness. Velvet have quietly become pioneers of live organic house music. They infuse psychedelic, acid-blues over phat house and hip hop beats into one very large show that is sure to make the dance floor groove. With an acoustic guitar, live bass, heavy beats and original song writing Velvet has a sound that is original yet strangely familiar. Velvet has shared the stage with the likes of The Chemical Brothers, Nelly Furtado, De La Soul and DJ Shadow. Velvet's front man Kuba won the gold medal at the National Songwriters Competition at the Canadian Music Week in 2005. For over a decade now Velvet have rocked it every Sunday night at Steamers in Victoria. Mexico City has been skanking to the cool-mestizo-reggae rhythms of the Rastrillos since 1988, grooving to their joys and pains, following their musical quest for basic human values--friendship, respect and love. Rastrillos music is a fusion of mexican popular music, with the root of reggae mixed with a taste of the jazz, funk, indu and ska traditional. The Rastrillos' songs talk about all they have experienced during this long voyage guided by the four winds. They have shared the stage with internationally renowned groups, and with the best the Mexican musical scene has to offer. "Allison Crowe has a voice to fall in love with. She is from Vancouver Island, from Irish and Manx stock. She's the sort of artist who can make serious headway on her own label and that's just what she's doing," says the UK's Record of the Day. Now living and recording in Newfoundland, the celebrated singer-songwriter-pianist returns to debut songs from her upcoming album, "This Little Bird", at a fundraiser for the Westcoast Community Resources Society. Advance Tickets: $15 General, $10 Students/Senior @ Crow's Nest, Words End, Beaches, Common Loaf, Wildside & Enchanted. Born of bush party ashes, Nelson's BC/DC has systematically redefined the concept of a tribute band. Their live show has become a legendary, and necessary "rite-of-passage" amongst their unwavering supporters and believers. With over-the-top stage energy, they deliver every last note of the classic songs with absolute authority. You get tired just watching them. bc/dc is heavily rooted in the Bon Scott-era catalog (Dirty Deeds, tnt, Jailbreak, Let There Be Rock), but also covers ac/dc's second "golden era" with all the essentials; Back in Black, For Those About to Rock, Hells Bells, and many more. Unlike many tribute acts claiming to be "North America's #1 Clone", BC/DC has turned the tables. The band takes a comedic approach, claiming the tunes as their own, and to having "heard of some bc/dc tribute band from Australia". Martinez has built a solid reputation around the world for his engaging wordplay, butter melodies and high-energy live performances. His live show has captivated audiences and spread his reputation as one of the best live performers out there. Josh takes on more subject matter in one song than most rappers do in their entire careers. Without a doubt Josh is one of the best live hiphop performers out there, he brings the heat with humor and intensity. Tofino concert listings for July 2007 from Tofino TIme Magazine. 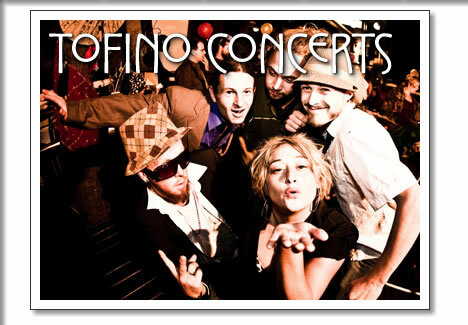 Shows at the Tofino Legion and other music events in Tofino.